Had Basic at Shaw Field. Sherrill was his instructor. He was in Squadron E at Douglas. He had Basic at Shaw Field. Graduated and had 56 missions in B-25’s in the C.B.I. (China/Burma/India) Theatre. He was awarded the Distinguished Flying Cross for voluntarily flying food and ammunition to a beleaguered Army group and for flying out wounded soldiers. In addition, he received a Commander’s Citation for rescuing a pilot who was drowning in the surf off the west coast of Africa. He spent thirty-eight years in public education, first as a teacher and later as a principal and an asst superintendent. 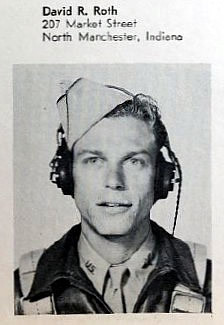 At Douglas, he was in Squadron E and his flight Instructor was Bill Sager. He had Basic at at Shaw and graduated from Turner Field, S/N: O-803681. He transitioned to B-24s in Smyrna, TN. He served in 466th Bomb Gp, 785th Bomb Sqdn. He was in some pile ups and in the B-24 “Jamaica” that crashed on the Normandy Beach in 1944. He retired on disability because of injuries. Originally of Louisville, KY. Later from Granite Shoals, Tx. He was in Squadron E at Douglas. He was in Squadron E at Douglas. Had Basic at Shaw Field. He was in Squadron E at Douglas. He was in 498th Bomb Gp., 874th Bomb Sqdn. He was in Squadron E at Douglas. He had Basic at Shaw Field and graduated from Turner Field, S/N: O-805384. He was in 46th Bomb Gp., 51st Bomb Sqdn. He was in Squadron E at Douglas. S/N: O-697764. He was in the 459th Bomb Gp. 159 Bomb Sqdn. On July 17, 1944, he was bombardier on a B-24 (S/N: 42-78281) on a mission on the Avignon Bridge, France. His plane’s left wing was hit by flak over the target. It burst into flame and the plane lifted upward. The crew bailed out, and some evaded capture. Bonnett was captured and made a P.O.W. (MACR #6755). He was in Squadron E at Douglas. S/N: O-544334. He was in the 9th A.F., 422nd Night Fighter Squadron P-61 Radar Operator, European Theater. He was in Squadron E at Douglas. Gordon Bellah was his instructor. He had basic at Shaw and graduated from Spence Field. Later he had 31 missions with the 8th A. F. 445th Bomb Gp. from England over Germany. He also instructed at Tonapah, NV. Was a Railroader prior to enlisting. He was in Squadron E at Douglas. He had Basic at Shaw Field. S/N: O-806618. He was with 15th Fighter Gp, 47th Fighter Sqdn. Graduated Turner Field, S/N: O-805393. He was in the 5th A.F. He was in Squadron E at Douglas. He was bombardier with the 484th Bomb Gp., 827th Bomb Sqdn. Medals: DFC, Air Medal, Commendation Ribbon, European-African-Middle Eastern Campaign Medal, Victory Medal, American Campaign Medal, National Defense Medal and Distinguished Unit Citation Medal. He went on to Barksdale A.F.B., Shreveport, La., as a jet pilot. Student Officer: Second Lieutenant, Squadron E at Douglas. He was in the 417th Bomb Gp, 674th Bomb Sqdn. He was in Squadron E at Douglas. He had Basic at Shaw Field. He was in Squadron E at Douglas. He had Basic at Shaw Field, Graduated from Turner Field S/N: O-805401. He was in the 397th Bomb Gp, 596th Bomb Sqdn. He was in Squadron E at Douglas. He had Basic at Shaw Field. Graduated from Turner Field, S/N: O-805402. He was in the 388th Bomb Gp, 561st Bomb Sqdn. He was killed in a flying accident 1945-05-17 in England, per Steven Burris records. He was in Squadron F at Douglas. He had Basic at Shaw Field and graduated from Turner Field, S/N: O-805416. He was in the 463rd Bomb Gp. 773rd Bomb Sqdn. On about his 36th mission, on June 27, 1944, he was pilot of a B-17G (S/N: 42-97536) with a crew of 10 on a mission to Budapest. His plane was hit by flak, and he ordered the crew to bail out. He became a P.O.W. in Stalag Luft 3. (MACR #6414). All crew survived but one of the crew died on the march of P.O.W.s from Nuremberg to Mooseburg, Germany. He was in Squadron F at Douglas. Of Mendon, Mich. and Port Arkansas, Texas. For a picture of Firestone with Instructor Cunningham, click here. Student Officer: Second Lieutenant, Squadron F. Rundlett was his instructor. He was in Squadron F at Douglas. He had Basic at Shaw Field. He graduated as a 2nd Lt. In 1943 he was flying P-39’s on patrol missions and was based in the Panama Canal Zone in the 16th Fighter Gp, 43rd Fighter Sqdn. On Oct. 11, 1943 he was killed in a mid air collision on an approach for a landing in Czechoslovakia. Student Officer: Second Lieutenant, Squadron G at Douglas. He was an Air Traffic Controller at Greenville, S. Caro. He died about Oct. 1968. He was in Squadron F at Douglas. He had Basic at Shaw Field and graduated from Turner Field, S/N: O-805477. He served in the S. Pacific in 20th A.F. (B-29) Bomb Gp. based on Tinian Island. He claims to have dropped the last bombs in WWII. He also flew in the Berlin Air Lift. Then flew some Radar Re-con missions over Russia and Vietnam. He retired after 25 years. He was in Squadron F at Douglas. Had Basic at Shaw Field. S/N: O-806689. He was a B-24 co-pilot assigned to the 376th Bomb Group 513th Bomb Sqdn and was killed on takeoff of a B-24D (S/N: 41-11848) in Cornwall England on March 17, 1944. His crew was on their way back to the Mediterranean Theater after transporting some pilots to England. 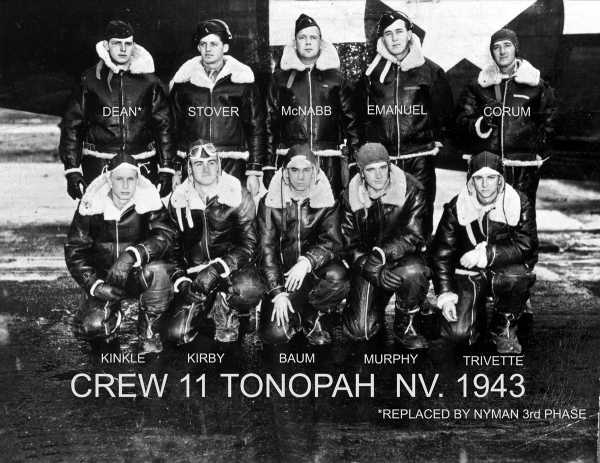 See http://www.armyaircorps-376bg.com/thurman_eugene_crew.html. He was in Squadron F at Douglas. P.T. Harris was his instructor. He had Basic at Shaw Field. He was in Squadron F at Douglas. P.T. Harris was his Instructor. He had Basic at Sumter and Graduated from Turner, S/N: O-805491 June 30, 1943. He went to the South Pacific and flew B-25’s, for 70 missions. Click here for his letter and pictures. He was in Squadron F and P.T. Harris was his Instructor at Douglas. He graduated from Turner Field, S/N: O-805495. He flew B-26s and was Commander of a base at Recife, Brazil. He was discharged in 1946. He was in Squadron F at Douglas. He had Basic at Shaw Field. He was in 500th Bomb Gp. 882nd Bomb Sqdn. On Feb. 19, 1945, he was co-pilot on a B-29 (S/N: 43-63494) with a crew of 11 in a mission on Tokyo. The plane was attacked by fighters and some of the crew bailed out. Kutchera was MIA but eventually declared killed in action (MACR #12250). Click here for more information. He was in Squadron F and Jim Ritter was his Instructor at Douglas. 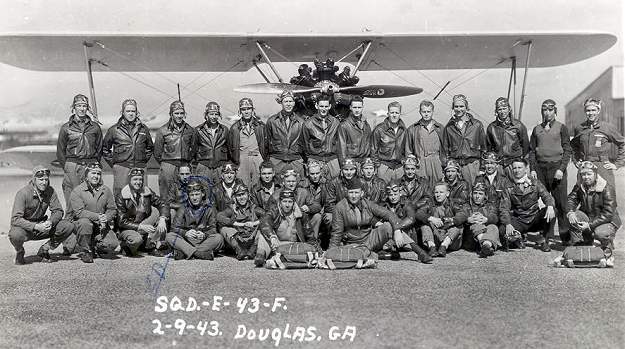 He graduated from Turner Field, S/N: O-805501 and was in the 91st Bomb Group 322 Bomb Sqdn. He made a career of the Air Force. He was in Squadron F at Douglas. He had Basic at Sumter. Graduated and flew B-24’s with the 7th A.F. out of Sidney, Australia. Died March 30, 2010 Age 92. Click here for his obituary in the Dayton Daily News. He was in Squadron F at Douglas. He had Basic at Shaw Field. He was in Squadron F at Douglas. Rundlett was his instructor. He became a navigator, S/N: O-699203. He was with 2nd Bomb Gp. 49th Bomb Sqdn. On May 26, 1944, he was navigator on a B-17G (S/N: 42-39999) on a mission on St. Etienne, France. The plane caught fire in the upper turret and Navigator Letz, along with the co-pilot, engineer and bombardier, bailed out. The rest of the crew stayed on board and the plane eventually landed safely. One chute was seen to open. One pilot chute was seen to be caught on the escape hatch of the plane. Letz survived the bailout, lived in Italy for about 5 months and returned to the U.S. (MACR #5831). He was in Squadron F at Douglas. He had Basic at Shaw Field where he washed out. He became a navigator and bombardier, S/N: O-700632. He was with the 459th Bomb Gp. 757th Squadron. He was captured after bailing out over Italy from a B-24G (S/N: 42-78191) on May 13, 1944 (MACR #4944). He was taken as a POW to Stalag Luft III at Sagan, marched from 1-27-45 to 4-4-45 to Nuremberg, then to Mooseburg 4-13-45 until liberated 4-29-45. He was liberated by Patton at Mooseburg. He escaped during the forced march near the Danube and rejoined POWs and Displaced Persons. He was discharged 12-13-45 in San Antonio Texas. 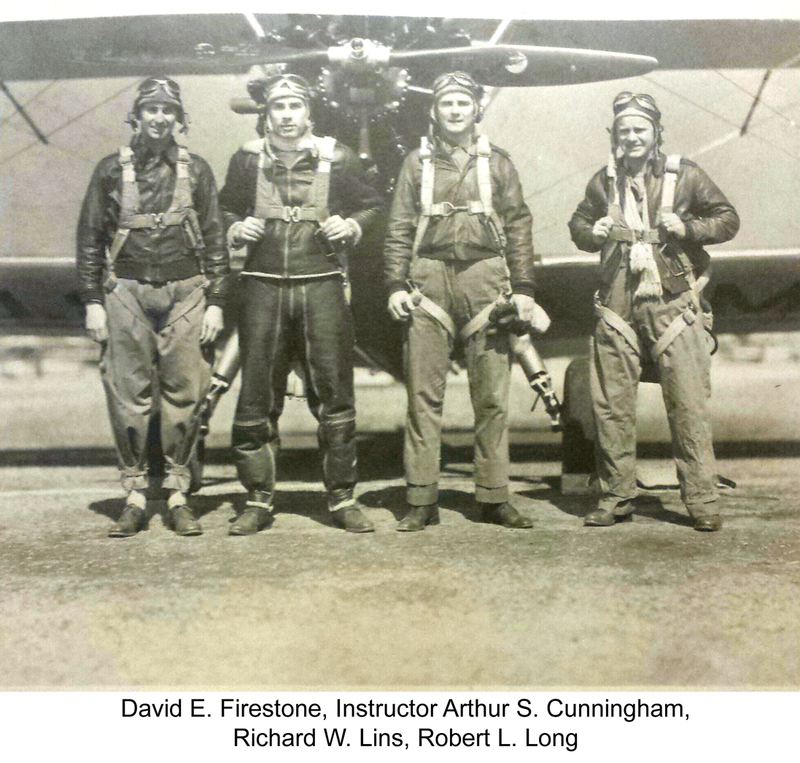 For a picture of Lins with Instructor Cunningham, click here. He was in Squadron F at Douglas. He served in the 8th Fighter Gp. 35th Fighter Sqdn. in the S. Pacific flying P-38’s. After the war he became a pilot for United Airlines and was flying 747’s toward the end of his career. (Fighter Gp. and Fighter Sqdn. per USAF historical research agency site). He was in Squadron G at Douglas. 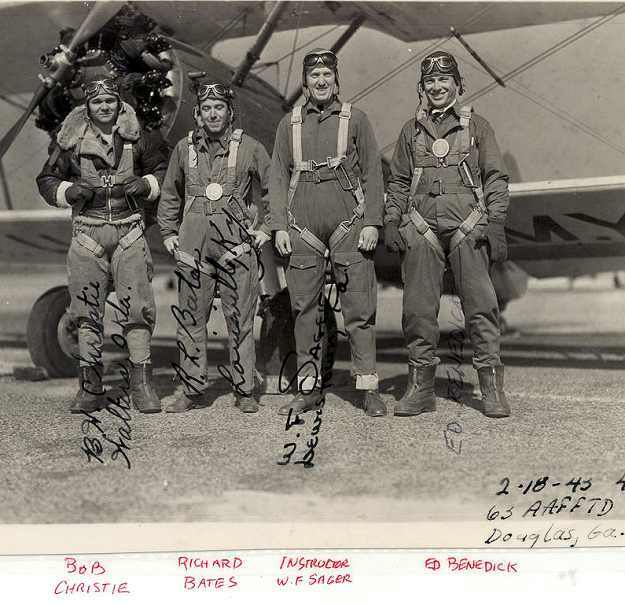 Click here for a picture of him with his B-24 crew. He was in Squadron G at Douglas. S/N: O-1692653. He was a radar operator in the 12th A.F. 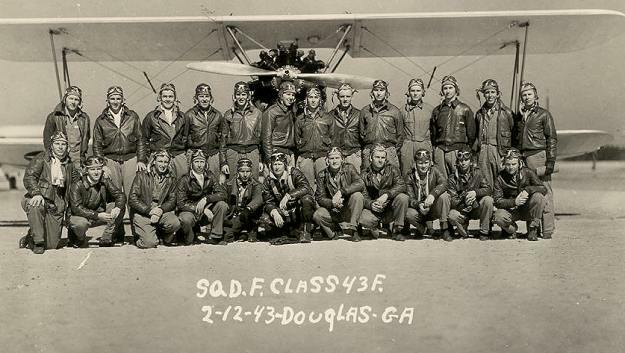 415th Night Fighter Sqdn, per Steven Burris and Wikipedia, which suggests that Meiers helped give unidentified enemy flying objects (the equivalent of today’s UFOs) the name, “Foo fighters” after he read Bill Holman’s book, Smokey Stover. He was in Squadron G at Douglas. S/N: O-696514 per Steve Burris. Meltzer became a bombardier in B-24’s in the 486th Bomb Gp (See photo from the Roanoke Valley Chapter of the International Plastic Modeler’s Society, Dec 2009 issue). He was in Squadron G at Douglas. He was stationed for a time at Adair Air Force Station in Corvallis and Chanute Field, Ill. He served as an enlisted liaison pilot in the 14th Air Force in China under the command of General Claire Chennault. Dewey received the Distinguished Flying Cross with one Oak Leaf Cluster after rescuing a downed P-38 pilot in interior China. Enlisted in Lawrence County, PA. He was in Squadron G at Douglas. He attended the Univ. Of Ga. prior to the Air Force. He had Basic at Shaw Field. He flew in England and was recalled for the Korean war. He was in Squadron G at Douglas. He had Basic at Shaw Field and graduated at Turner, S/N: O-805522, and flew 25 missions in B-24’s in the 6th Photo Reconnaissance Gp, possibly 20th CMS(?) in the South Pacific. This was in a Recon Sqdn. taking combat pictures and mapping. He died in Sept. 1985. He was in Squadron G at Douglas. He had Basic at Shaw and graduated from Tuner Field, S/N: O-805523. He flew B-24s in the 11th A.F. 404th Bomb Sqdn. 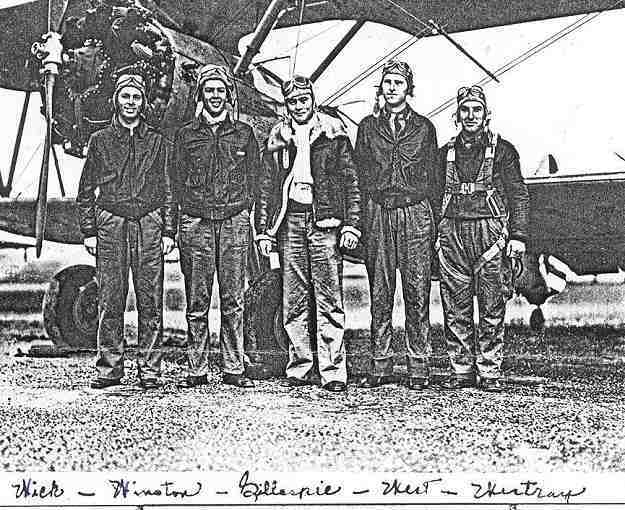 (H) in the Aleutians and was among 291 pilots interned in Russia during the war. He was interned 25 Sept 1944. He was in Squadron G at Douglas. He had basic at Shaw Field. He was in Squadron G at Douglas. He graduated from Clemson, and had a career in Textiles and in Mortgage Banking. He was in Squadron G and Kenneth Cornell was his instructor at Douglas. He had Basic at Shaw Field and Graduated from Turner Field, S/N: O-805524. He was in the 381st Bomb Gp. 534th Bomb Sqdn. flying B-17s. He was pilot of a crew of 9 in a B-17G (S/N: 42-97174) while over Berlin on June 21, 1944, and was a P.O.W. for 313 days (MACR #5993). Afterward he was an Air Traffic Controller at Kansas City for 30 years and 9 months. He was in Squadron G at Douglas. S/N: O-806725. He was in the 35th Fighter Gp. 40th Fighter Sqdn. flying P-47’s, per P-47 Thunderbolt At War by Hess, William N. He is credited with at least 2 enemy aircraft. He was in Squadron G and George Wydetic was his instructor at Douglas. He had Basic at Gunter and graduated from Napier Field. He went to Florida to learn fighters but was reassigned, with many others, to B-24’s. He had a chance to get back into fighters and did. He flew P-39’s, A-24’s, P-38’s, and P-47’s. He served in the Western Pacific, including Saipan. He went back into active duty in 1951, serving in air defence, flying F-86D, F-89D & J, F-102, and F101B in Alaska and Calif. He made the Air Force a career. He retired in Aug. 1973. Carroll County, WV, and MD. He was in Squadron G, and Ashley Dupraw was his instructor at Douglas. He was in Squadron G and Ashley Dupraw was his instructor at Douglas. He had Basic at Gunter Field and graduated from Marianna Army Air Field in FL. was trained for P-47’s. Soon was transferred to B-24’s and went to England in the 487th Bomb Gp. 839th Bomb Sqdn. He had 33 missions in B-24’s and 16 in B-17’s. He was shot down but got back to England. Later flew in the Berlin Airlift. He went to work for Pan American Airlines in 1950. Read his very interesting bio and see his picture here (PDF). He was in Squadron G, and Ashley Dupraw was his instructor at Douglas. 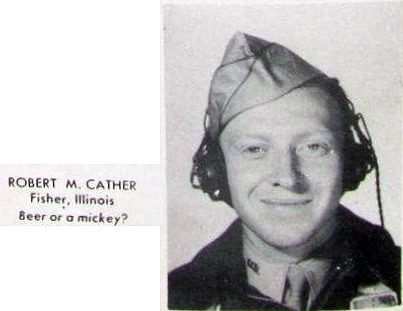 He graduated as a bombardier with the Class of 43-15 (November 13, 1943) at Midland Field (Texas), S/N: O-695376. He was in the 485th Bomb Gp. 829th Bomb Sqdn. On June 9, 1944, he was bombardier on a B-24H (S/N: 41-28782) on a mission from Venosa, Italy to Munich, Germany. The plane was shot down; he was injured and became a P.O.W. (MACR #6042). He was in Squadron G and Dupraw was his flight Instructor at Douglas. He made Capt. and was an assistant Sqdn. Commander. He was in Squadron G at Douglas. S/N: O-808742. He was in the 371st Fighter Gp., 405th Fighter Sqdn. On Apri. 12, 1944 he was killed in a flying accident in England while flying a P-47 (S/N: 42-75252). He was in Squadron G at Douglas. He became a bombardier (S/N: O-766244) with the 447th Bomb Gp. He was in Squadron G at Douglas. James Annin was his instructor at Douglas. He graduated from Napier Field, S/N: O-806528. He flew 107 missions in the C.B.I. (China-Burma-India) Theatre. He went into the Reserves and was recalled for the Korean War, and spent 21 more months on active duty. He flew P-29’s and KC-97 refueling planes. Buried Willamette National Cemetery, Portland, Ore. He was in Squadron G at Douglas. He became a navigator in the 457th Bomb Group in the European Theater. He was in Squadron H at Douglas. He was attached to the 3rd. Combat Cargo in the China Burma India theatre. He flew countless hours over the “Hump” in C-47s. He was in Squadron H at Douglas. He served 23 years in the Air Force in both World War II and Korea. He was in Squadron H at Douglas. S/N: O-806534. He was in the 443rd Troup Carrier Group, 315th Troup Carrier Sqdn. On Feb. 18, 1944, he was co-pilot of a C-47A (S/N: 42-100693) on a food drop mission to Lawang, Indonesia from Sookerating Airfield, India. The plane crashed and 6 of the 8 crew members were killed, including Sirlouis (MACR #11973). He was in Squadron H at Douglas. He was in Squadron H and Bob Lape was one of his instructors at Douglas. He graduated from Napier, S/N: O-806539. He started out in AT-6’s for fighter training. Then was switched to C-47’s when there were too many fighter pilots. He was in the 6th Ferrying GP, 52nd FY. He delivered aircraft to bases all over the world and flew the “Hump” many times. Afterward he flew G. I. students for 15 years. Then was an Executive Pilot for 9 years. He was in Squadron H at Douglas. S/N: O-806162. He was in Squadron H at Douglas. S/N: O-806006. He was with 392nd Bomb Gp. 577th Bomb Sqdn. On Mar. 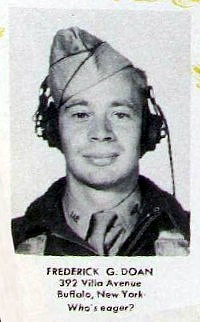 18, 1944, he was co-pilot on a B-24H (S/N: 41-29174) on a mission to Friedrichshafen, Germany. The plane collided with another B-24 before reaching the target and all but one of the crew members on both planes were killed (MACR #3320). He was in Squadron H at Douglas. S/N: O-806168. He was in the 9th A.F., 575th Bomb Squadron, 391st Bomb Group (M). He was given the D.F.C. posthumously for a mission in a B-26 Medium Bomber participating in a bombing mission on 7 June 1944. See http://militarytimes.com/. His B-26 (S/N: 42-95848) was hit by flak, fell out of formation under control, 4 chutes appeared before it went out of control and crashed in a field N of Brouze. 2 survivors. See http://www3.uakron.edu/. He was in Squadron H at Douglas. He became a navigator (S/N: O-692080) with the 452nd Bomb Gp. 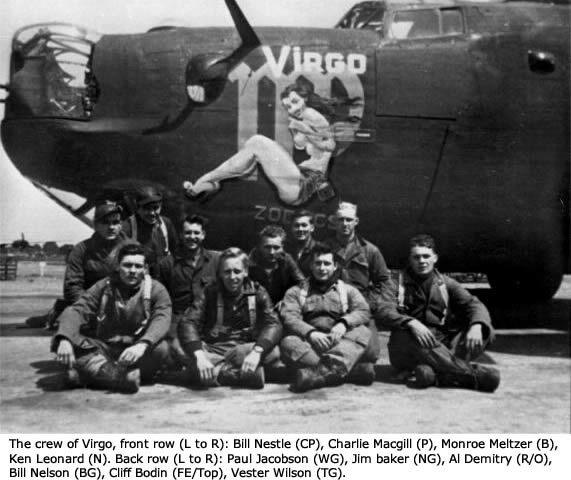 729th Bomb Sqdn. Sam Topous was his Instructor. He had Basic at Gunter Field and graduated from Napier. Earl was in single engine Advanced school, but as they graduated the whole class was assigned to the 403rd Troop Carrier Group, 63rd Sqdn. 13th Air Force. They were based at Pekoa Air Field in the New Hebrides for many months. Earl flew 110 missions. He was discharged in Nov.1945. About 1950 he became interested in helicopters and made his career flying them. Click here for a group picture at Douglas. Click here for his bio (a PDF). 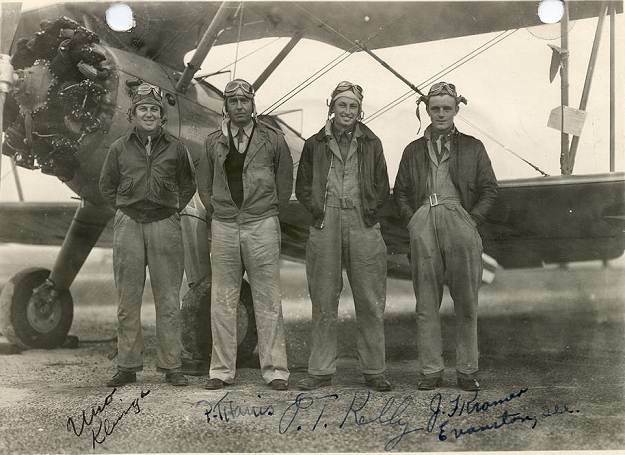 He was in Squadron H, and Eugene Gillespie was his instructor at Douglas. He had Basic at Gunter and Advanced at Napier Field. He went into Multi-engine C-47’s and B-25’s. Later went to Pensacola for Navy training. He was eligible to wear both A.A.F. & Navy Wings. He flew PBY’s in the mid Pacific for search and rescue. He flew hundreds of missions in C-54’s in the Berlin Air Lift in 1949. He flew search and rescue missions in the Korean War, flying SA-16’s (HU-16 Albatross). He stayed in the Air Force, with a short exception, until he was Chief of Plans for all Air Force Reserve bases and facilities at the Pentagon. Next he was in Command of Close Air Support Group until he retired in 1971. Click here for his bio and pictures (a PDF). He was in Squadron H, and Eugene Gillespie was his instructor at Douglas. 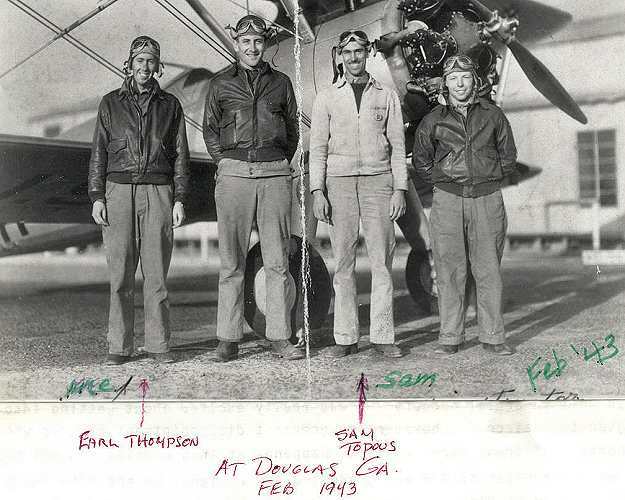 He was in Squadron H, and Eugene Gillespie was his instructor at Douglas. He was with the 92nd Bomb Gp. 325th Bomb Sqdn. and flew B-17’s.